Adolescent girls in this program developed a new flip chart presentation called Penin Perumai to disseminate information about puberty, reproductive health, and gender to their peers. We have published an accompanying teacher guide and translated the story into a short film. Nalamdana supports students from economically challenged backgrounds to help them complete high school. Students are selected through a rigorous screening process and must maintain good grades and participate in community service. Skill development and career guidance are offered. Top to Toe addresses all aspects of health and rights of children between the ages of 10 and 15 years using illustrated booklets that children can keep. The booklets have been field tested and checked by experts in each topic and inspired our peer education toolkit for 12 to 14 year olds. This project uses netball to empower girls from challenged backgrounds. Netball is similar to basketball, but emphasises team play and communication. The entire curriculum spans ten months and covers four life skills modules, and participants are linked to training and career-building opportunities. 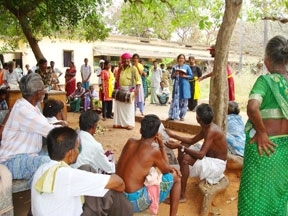 Nalamdana was approved by The World Health Organization (WHO) to create gender sensitive programming through participatory, innovative communication at Chennai’s largest Government Hospital where free ART and TB treatment is offered to citizens. There is a huge taboo in most Indian households, especially in the villages, to build toilets. In the rare event of one being built, the skill on how to use them, keep them clean and where and how the waste from it is treated or cleaned, is never quite understood. Donations from Individual donors are routed through True Gifts, operated by Bhoomika Trust, effectively linking private contributions with our program needs. Since 2001, Nalamdana has been supporting the nutritional supplement to the Government noon meal scheme in Besant Nagar. The South India Girl Child Initiative, (SIGCI), is a three year project funded by World Education, Boston. 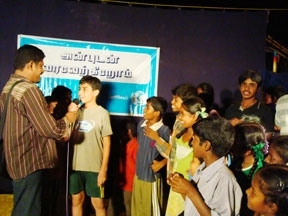 Of the four participating NGOs, two are from Tamil Nadu and two are from Andhra Pradesh. The most fascinating aspect of this initiative is its elbow room. 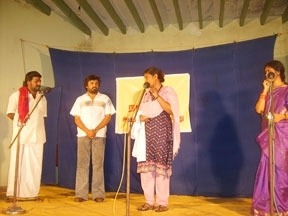 Project funded by The William J. Clinton Foundation – Clinton Health Access Initiative (CHAI) piloted a four month participatory theatre programs at Chitoor and Tirupathi ART Centre to increase HIV/AIDS awareness as part of their Balashyoga (BSY) program. Are You Well” Project at Tambaram, focuses on care and support for the patients of the Government Hospital of Thoracic Medicine, which is one of the largest public hospitals in Asia catering to both TB an HIV patients.